The Mattress Warranty & Trial Period are something that may make an impact on your final purchasing decision. With online mattress purchasing growing daily all aspects of what’s included with your mattress, including the warranty and trial period, may give you greater confidence in your choice at the end. But, how important is a warranty and trial period? And how much emphasis should you put on them in your final decision? Regardless of where or how you purchase your mattress, any newly purchased mattress will have a warranty. The actual mattress warranty will have inclusions and exclusions. These will vary depending on several factors. These factors are put in place by the manufacturer and typically coincide with the price, materials (including the durability and quality) and in many instances the average wear expected of the mattress. Warranties are something that are important but really shouldn’t be your deciding factor. If there is genuinely something wrong or defective with the mattress you will more than likely know sooner than later. The percentage of defects or errors with mattresses is very minimal. However, many companies will happily replace a mattress that falls into this category. Warranties start to get fuzzy the longer you have a mattress. The added natural wear can make mattresses loose their initial feel and comfort. This is why many warranties are prorated to take the natural life of the bed into account. A warranty is really put in place for defective or rare cases that cause the mattress not to perform or hold up as intended. In the grand scheme of things your likely hood of utilizing a warranty is very slim. Though it is important to have something in place for these flukes. Your focus on your mattress purchase shouldn’t revolve solely around this aspect. If you are curious about the details and fine print of a warranty look for an explanation of the warranty on the manufacturers website. Typically this section will be easy to find. Many times it will be clearly listed in the footer or bottom of the homepage. A trial period is almost always included when buying a mattress online. You will have a good idea of what you are getting before you order. However, your body may not adjust to the mattress right away. And sometimes, not at all. This is why there is a trial period in place. To allow for a period of time to let your body adjust and make sure it is the right mattress for you. Since you aren’t able to try the mattress out before ordering this helps ensure that you will be happy with your purchase. And if not, a typically easy process to adjust or return the bed is in place. 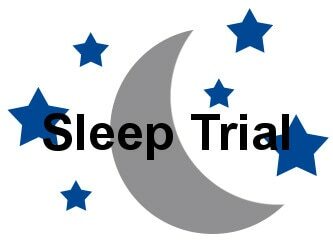 Many companies with sleep trials have a minimum period of 100 nights to make up your mind. This allows for your body to try the bed out for several weeks and make any adjustments to it. A trial period is definitely helpful when purchasing a product like a mattress online where it is sight unseen. Some companies offer a longer trial period, which allows for more time to “test drive” the bed. However, 100 nights is typically more than enough time. We wouldn’t focus too much on making your purchase based on the additional number of days in the trial period. A few companies out there won’t offer trial periods and instead have a comfort guarantee. This is where they can make adjustments to the mattress to ensure that it will be ideal for you. However, this usually means they won’t accept returns. If you are a bit more skeptical on how you will adjust to a bed purchased without trying first, looking for an online mattress that offers a sleep trial is a good idea for you. At the end of the day, both the mattress warranty & trial period are helpful additions to ensuring your mattress will be taken care of by the manufacturer. Having a sufficient warranty and amount of time to try the mattress are fairly standard in the online mattress market place. So focusing on either of these too much shouldn’t be necessary when making your final decision. Just make sure that you are comfortable with what is being offered for the warranty and trial period. As well as being aware of what to expect. Especially if you end up in that rare case that you have a warranty issue or end up not being able to adjust to your new mattress. Our Sleep Guide is here to help answer all your questions! Feel free to Contact Us and we will get back to you as quick as we can.